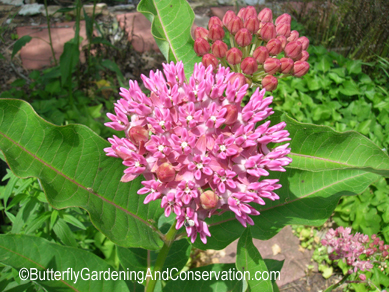 Purple Milkweed (Asclepias purpurascens) is a beautiful member of the milkweed family. 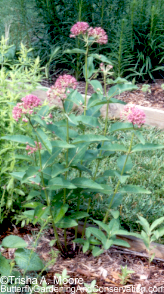 It can grow up to three feet tall with leaves that are broad and thick compared to butterfly weed and tropical milkweed. Purple Milkweed blooms early in the spring with flowers that are in general a bit more showy than some species of milkweed. The flowers are a deep purple/magenta like color that is very beautiful. In general, milkweeds contain cardiac glycosides and resinoids which are poisonous, although for people quite a bit would need to be ingested. The cardiac glycosides interfere with cell membrane sodium/potassium pumps. Cardiac glycosides are also used to treat congestive heart failure and cardiac arrhythmia. It can take three or more years for a new seedling to bloom. 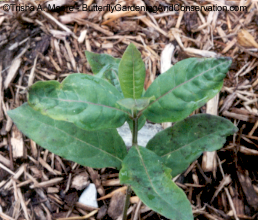 Purple Milkweed, like other milkweeds, are host plants for Monarch butterflies. Monarchs in my area will lay eggs on it, especially early in the season when some of the other milkweeds have not come back up yet. The poisons in the milkweed plants do not bother Monarchs. Instead they make them taste bad to potential predators. Typical nurseries don't usually sell this plant. 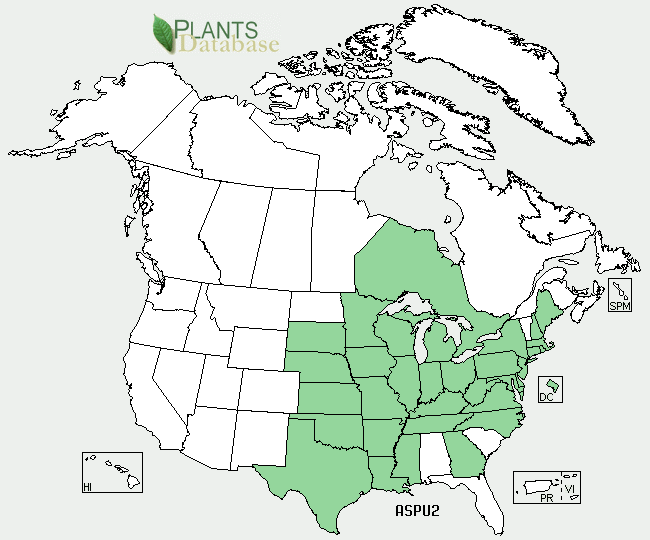 You will most likely have to find a native plant nursery. My experience with this plant has been very good. However, the ones I grew from seed looked terrible the first couple years I had them. I didn't think they would survive. They start out growing pretty slow. If I wanted to get more I would probably buy the plant rather than to start from seed. New seedlings may not bloom for the first few years after germinating. And once mine started blooming the seed pods were not healthy or producing a significant amount of seed either. Even though I've read that purple milkweed doesn't spread, I think that it does or can a little bit. Not enough to be considered invasive though. I'm not sure how many purple milkweeds I have growing, not a whole lot though. But I love them because the flowers are so pretty and they provide a place for Monarchs to lay eggs before the other milkweeds are growing. I've found eggs on them in the spring when the stems are just barely sticking out of the ground. Since the leaves are pretty thick I don't think Monarchs like them as well as Swamp Milkweed (Asclepias incarnata) and Tropical Milkweed (Asclepias curassavica), but will use them, especially early in the season. This family has about 250 genera and roughly 2000 species. Mostly tropical and subtropical. Some species are herbs, others are vines and shrubs. Most have a milky sap containing poisons (see above).